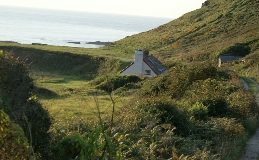 In 2010 our newly discovered circular walk to the beach and Gazebo was open for visitors to enjoy. A small path created in the 19th century by Sir Lewis Stucley, subsequently overgrown since the First World War, has recently been restored. 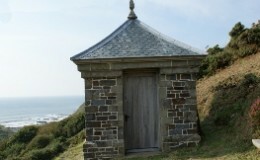 This exciting discovery leads visitors through woodland to the Gazebo offering stunning views of the Atlantic. 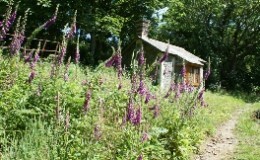 Visitors are also able to reach the wild Atlantic Cove and the newly restored Gazebo via our established woodland walk. This popular walk leads to some of the most spectacular cliff scenery in the British Isles. In spring it is carpeted in bluebells, primroses and many wildflowers. The cliff flowers in April, May and June are beautiful and diverse; they were the subject of ‘BBC Gardeners World’ introduced by Dan Pearson in 1999. During the autumn 2005 the cottage at Blackpool Mill and the surrounding area was used as a location for Rosamunde Pilcher’s ‘The Shell Seekers’ starring Vanessa Redgrave, Maximillian Schell, Maisie Dimbleby and Alastair Mackenzie. In 2007 it was the stunning location for Andrew Davies’s adaptation for the BBC of Sense and Sensibility and in 2015 scenes from John Le Carre’s ‘The Night Manager’ were filmed at the cottage.